Join us on National Public Lands Day, September 22nd, at Forest Festival held at the DuPont State Recreational Forest. HRI staff will be leading hikes to Wintergreen Falls as we look at and discuss the hemlock trees of DuPont and the invasive insect, hemlock woolly adelgid, that is attacking them. We will talk about the importance of hemlocks, the threat they are facing, and the response at DuPont and elsewhere in the region. Along the way, we will get to see some of DuPont’s hemlocks that have been chemically treated for hemlock woolly adelgid in the recent past. We will hike 3 miles out-and-back from the Guion Farms Access Area to Wintergreen Falls, a beautiful jewel tucked back in the woods on Grassy Creek. Hikes will start at 12 and 4 p.m.
HRI will also have a booth at the Guion Farms Access Area all day to answer questions about hemlocks and what property owners can do to protect their trees. 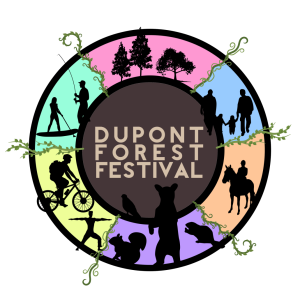 See the full schedule of Forest Festival events at the Friends of DuPont Forest website. ← Welcome to newest AmeriCorps Project Conserve member!